Carmelon Digital Marketing is a comprehensive and advanced digital marketing solutions and services company which was founded by Yair Carmel and Ofer Wizel in 2009. The company is known to offer a wide range of leading companies internationally with successful digital marketing techniques. The company is a team of SEO and UI professionals including Google AdWords and Analytics certified experts, content editors, social media professionals and content writers who are dedicated to design, manage and provide oversight for complex and high-budget campaigns for clients. Our mission is to generate noteworthy marketing and sales success stories at minimal costs. I had the pleasure of working with Carmelon on a few major projects, and these guys are absolutely great! They are always up to date with new SEO trends and overall they are true SEO masters, with a deep understanding of digital marketing. Carmelon Digital Marketing and its team are SEO and SEM professionals who provide excellent service with well based knowledge,and top notch team members. I recommend having them as your main online marketing service provider, one of a kind! very professional SEO agency and aditinal digital markting services , great results with excellent service. advanced site with a wide range of professional content ! I've been working with Carmelon Digital Marketing for a few years now, and I can say that Carmelon's team is the most professional team I've been working with. Pro-active, accurate and effective. Carmelon is a most valuable partner: professional, knowledgable, always looking for the best interest of the clients. I love working with the company and highly recommend them to anyone who is looking for an extraordinary service. 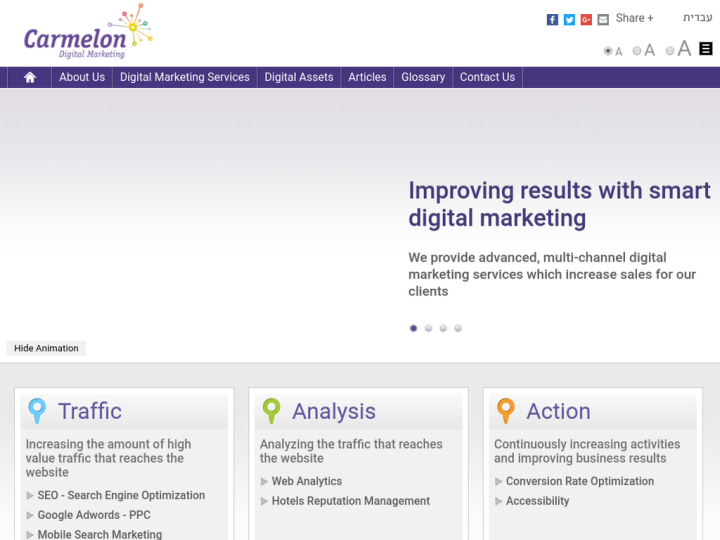 Carmelon is a great partner for Digital Marketing, SEO, SEM and TRENDS. They bring dedication and ambitiousness with their professionalism.